The ENSTA research team have developed robots (pictured) that can detect emotions and change their behaviour accordingly. Robots are now so smart they can work out whether you're male or female and even what your personality is like from one handshake. Researchers are developing an 'emotional' humanoid robot that is sensitive to human touch and can read social situations so they always come across as polite and empathetic. In addition to looking like a human, robots must also become more sociable so they can integrate into human environments, researchers say. 'Giving robots a personality is the only way our relationship with artificial intelligence will survive', said Professor Adriana Tapus from ENSTA ParisTech, Université Paris-Saclay. 'Our research will help the next generation of social robots to be polite, empathetic, and maybe have their own sense of humour', she said. The ENSTA robots detect emotions and change their behaviour accordingly. First results show a robot is capable of inferring someone's gender and personality in 75 per cent of cases simply by shaking hands. 'We are first developing a model of handshaking for women and men, for extroverted and introverted individuals, and based on this model we are able to infer the personality trait and the gender', Dr Tapus told MailOnline. So for example when they can judge a person's handshake by the stiffness of their arm and how much they move their hand. 'We could show that during a female to male handshake both participants apply less pressure than for a male to male handshake', Dr Tapus told MailOnline. 'The other features show that female handshakes are longer and have a lower frequency. 'What is also notable is that the hand of the male receiver is pointing down when he handshakes a female participant', she said. Researchers believe this could be due to the fact that female participants are on average smaller. The team have also studied emotion recognition as part of a project to help people suffering with Autistic Syndrome Disorder (ASD). 'If we can simulate a human like emotional response from a robot we can ensure a two-way relationship, benefiting the most vulnerable and isolated members of our society'. People with ASD often have difficulty recognising social stimuli but past research has shown that they find it more easy to interact with robots. Using robots could help autism sufferers become more social. This work also means that robots have the potential to become carers for our ageing population, work with humans to complete complex tasks and intervene in situations where human contact is welcome. Earlier this week, scientists warned children could soon be ditching their human best friends to spend time with a robot instead, a scientists has warned. It comes as a survey claims a fifth of youngsters aged between five and 18-years-old say they expect to become friends with a robot in the future. Professor Angelo Cangelosi, director of the centre for robotics and neural systems at the University of Plymouth, said it was likely that young people growing up with AI and robot technology today would develop closer relationships with them in the future. He said: 'Robots of today are a fascinating preview of how we might be living our lives tomorrow. Robots are now so smart they can work out whether you're male or female and even what your personality is like from one handshake. 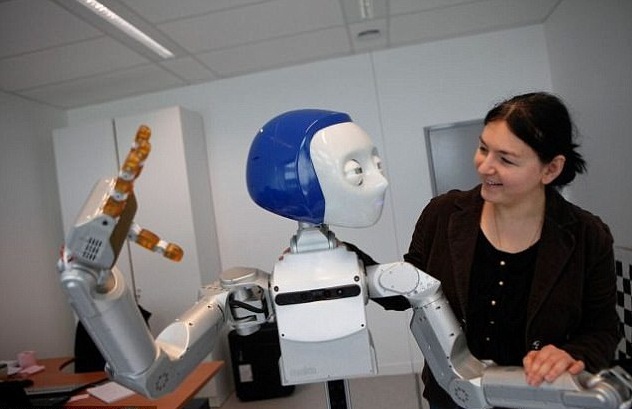 Researchers are developing an 'emotional' humanoid robot that is sensitive to human touch and can read social situations so they always come across as polite and empathetic.